The room around is quiet as the doctors work. The electrocardiograph beeps in the distance monitoring the vitals of my wife, and the doctors work to sew her up. Before us is our new child, a beautiful baby girl, and I’m there next to myself. Almost as if I was having an out-of-body experience, I can see myself and my wife, as if I had been here once before. Yet this isn’t me losing my mind, nor is something wrong with me. I haven’t died and gone to any other reality. Instead, I’m reliving my memories through the wonders of virtual reality, and it’s an idea of where the future will take us. How did we get here? It started with an idea. They always do these things, these articles that plan to be written, because outside of the regularity of news and the consistency of products that need to be reviewed, features usually need a reason to be created. 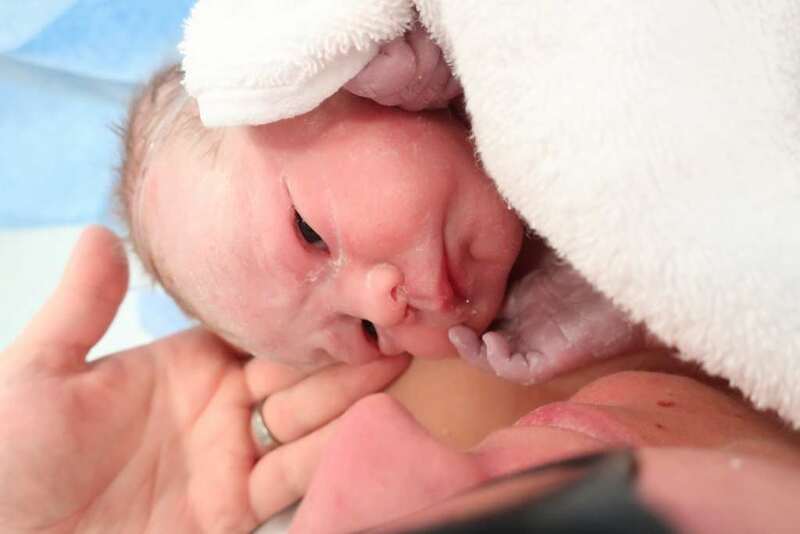 In the case of this one, the idea was this: my wife was pregnant and due to give birth, and we had been told during one of the prenatal classes that it was worth remembering the baby’s eyes the moment he or she was brought into the world. At that point, we were told, the newborn’s brain would flicker into action, and its eyes would open and then close, and then open and close, as if the new life was struggling to take everything in, a moment we were told you would only get once. The midwife at the prenatal class had forewarned not to spend time taking photos during this time, and to gaze at the child, capturing this once-in-a-lifetime scene with our own eyes, making the capturing of memories difficult. For this, we’d only have our own memories. It seemed astonishing that in a day and age where anything and everything could be digitised, this moment – this one-time thing – couldn’t be relived, and that made me wonder: could this memory be captured and brought back to life? Could my wife and I revisit this miraculous moment again and again, even later in life? When age had settled in and our brains started to fade, could we go back to this point, could we travel in time and see this scene? Could we revisit the past? The idea led to the question, and it was one I had often thought about. We had evolved by recording the past through imagery, using the painted medium initially but evolving to the photographic and then to that of a filmed media, the video and such. Where would we go to next? A jump to pure science fiction and Star Trek’s “Holodeck” was surely out of reach and would be for a long time, but could we get close with today’s technology? Was it possible to reinsert ourselves into our memories, as if we were standing there? Strange days, indeed, because with the technology of today, that much is possible. Is the VR headset the modern day Holodeck? Before the year 2000 arrived, Kathryn Bigelow’s sci-fi thriller “Strange Days” depicted the future as a place where your memories could always be relived simply by attaching a few electrodes to your head and throwing in a special Mini Disc. The murder plot of “Strange Days” notwithstanding, aspects of the film from a technology standpoint are here, and can be recreated using the technology of now. Sure, the Mini Disc thing is dead, and while my collection of albums stored on tiny square discs upstairs in a box somewhere isn’t going anywhere else fast, we still use media to store information. The difference, though, is that our media is less likely to be bandied about, shown, and traded. These days, we store on memory, and can capture those vital memories using more advanced cameras than we’ve ever had. So advanced that some of our cameras even include two lenses, and two lenses that open up wide to view, well, everything. That is the very essence of what makes up a VR camera, a device that is either made up of lots of little cameras focused into a 360 degree sphere to capture the full scope of what craning the human neck could capture, or one camera with enough lenses to do much the same. Capturing a scene using this style of camera caters for a unique sort of playback experience, because while regular cameras allow you to watch one viewpoint, a VR camera can handle not just the one intended viewpoint, but the rest of the scene in its entirety as if you were there. Virtual reality headsets are also growing in number, and will only become more available as time goes on. That made the approach of VR for memories suitable, as with the right camera we could grab a scene that would recreate being there. To do this, I’d need a camera that would be easy to hold, since this would be our first child, and I had no idea what to expect. 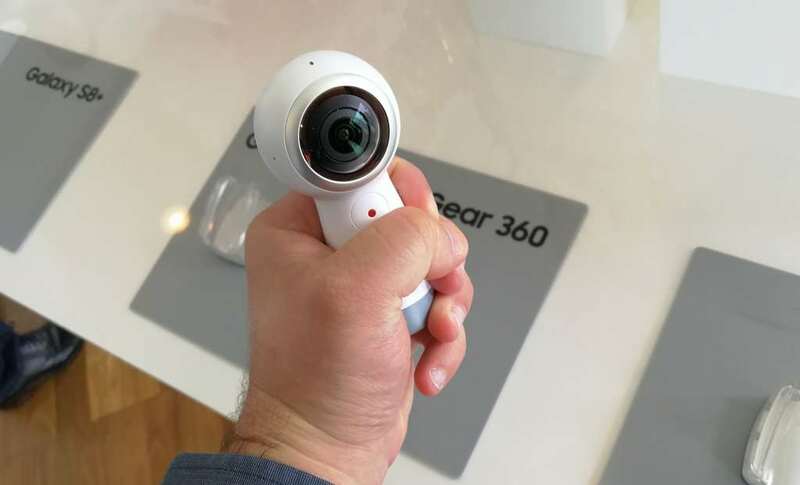 With that in mind, we chose Samsung’s second-generation Gear 360, a camera that had not only improved in sensor technology now supporting 4K 360 degree capture, but also had improved dramatically in shape, as Samsung shifted from the wholly spherical design into a spherical design with a grip. That grip would make all the difference, because it meant we could hold it out to one side and simulate the person being that extended hand, as if the camera were the eyes and our hands were wrapped around the shoulders of the theoretical invisible friend that would be standing in. And so that’s what we did. Gripping the Samsung Gear 360 camera, we captured imagery as if a second person was there, pressing the easy to find record button and grabbing the scene in a full 360 degrees. At one point, medical personnel seemed confused, and nurses looked at us as if we were mad. “What’s that?” they asked, trying to gauge the massive spherical lens it offered up, which we explained to their quizzical looks. We told them that we wanted to remember this scene and its memory for as long as we could, and while we could capture what was going on from one view point, it would be more encompassing if we could capture it and allow us to look around, to really feel like we were there. 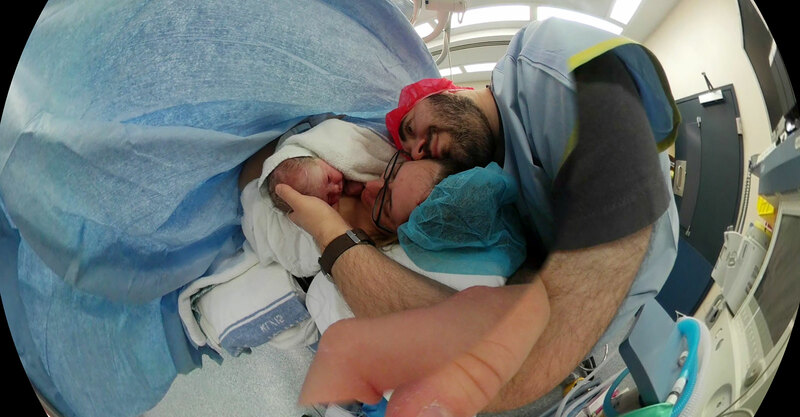 And that’s what we did, capturing the birth of our first child, the delightful Ms. Emma Stark, with a video unlike any other that we could relive again and again and again. 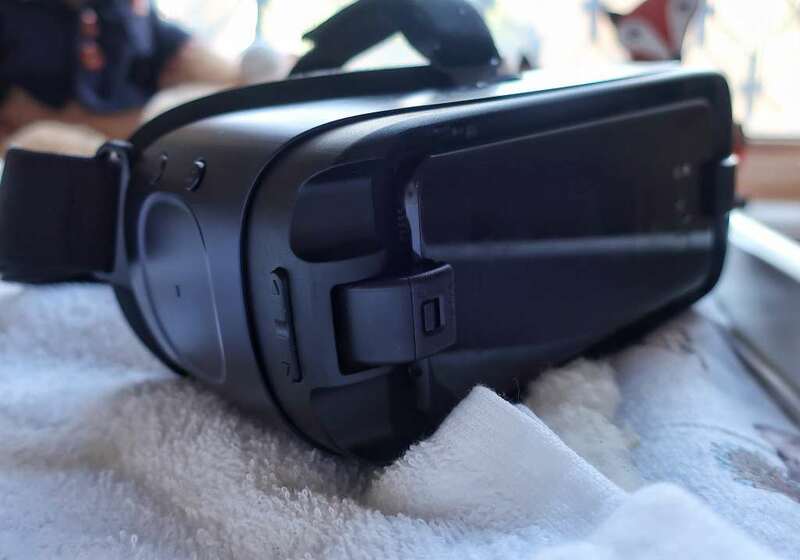 Experiencing that video today can be handled through a smartphone by itself, or it can be plugged into a virtual reality headset, like that of Samsung’s Gear VR or Google’s Daydream View VR headset, and even that of Google Cardboard. 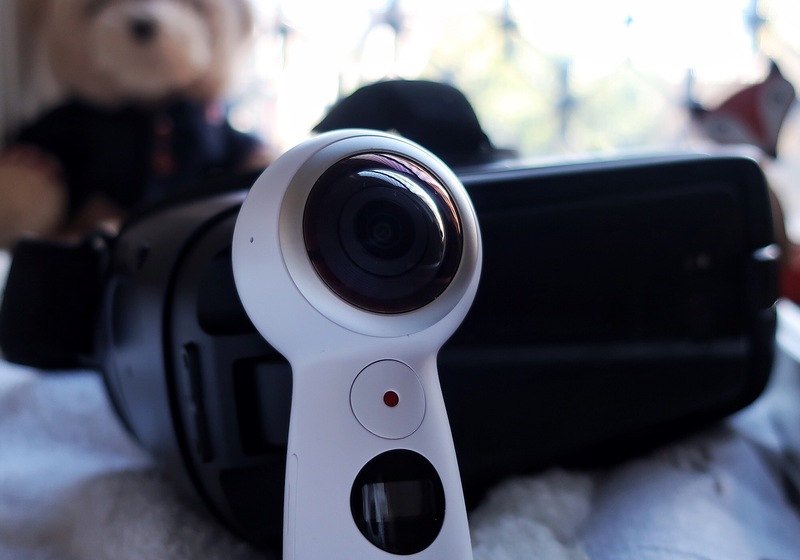 It’s not a remarkably difficult thing to load into place, and Samsung’s Gear 360 camera does what every good VR camera should do, stitching the scene and opening up the size and dimensions to make it feel like a sphere you can move around in. While we humans could only really look in 180 degrees around, we can always turn in spot or look over our shoulder, thereby needing the rest of the 360 degree world. And while the stitching could do with a bit of work – because let’s face it: putting together scenes of multiple lenses is never going to work seamlessly – Samsung’s Gear 360 did a tremendous job, especially since it did it without the help of a big computer or a dedicated post-processing system, like how big VR productions will be made. The result was one that captured what we wanted to experience, as if we were there with someone else, as if we were watching history replay over and over again, and could do so inside of a VR headset. In the future, the playback of tomorrow may not even need such a closed off environment. As VR slowly becomes normal and the curious world of mixed reality opens up, filtering virtual reality into the world of the every day, it wouldn’t surprise this writer to find that the watching of VR could be extended to transparent glasses, allowing the viewer to not only experience the memories in full 360 degrees, but also keep going on with life. We might even see it projected onto walls around us, creating what could essentially be a less physical edition of Star Trek’s Holodeck, visualising the memory in a greater way than a camera. And we don’t say this to soil the camera in the slightest. Capturing an image still means an immense amount, and nothing will ever sully the field of photography since an image can still deliver some of the greatest of meaning. But with memories now able to be re-experienced again and again, how we view our history is about to change, as strange days arrive, ready for you to take the first step and remember in a whole new way.